Ajimobi made the promise in his address during the Mawlid Nabiyy (celebration of Holy Prophet Muhammad’s (SAW) birthday) at the Government House Arcade, Agodi, Ibadan, on Friday. The Governor who said he was pained by the cash crunch that had made regular payment of salaries and pensions impossible, expressed optimism that the state would be able to pay at least two months salaries, out of the three months arrears, before the coming celebrations. With a workforce of more than 40,000, which he said was one of the largest in the country, Ajimobi said that the administration had been very prudent in the management of the dwindling accruals to the state. He said, “Let me assures citizens that we will spend the Paris Club excess deduction refund being expected from the Federal Government prudently. We have that record of spending past refunds and budget support fund judiciously. 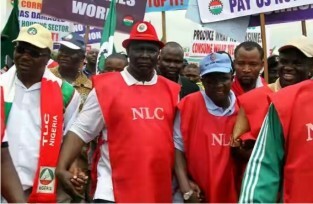 “Workers and pensioners will celebrate the coming festivities with joy, because we should be able to pay at least two months from the three months arrears we owe workers before the holidays. He said the essence of the Prophet’s birthday celebration was to remind the people of the need to love and respect one another and fear only the Almighty in all their endeavours. An Islamic preacher, Sheik Muyideen Ajani Bello and the Chairman of the state’s Muslim Community, Alhaji Kunle Sanni, said that Ajimobi deserved all the plaudits he had so far received from the Islamic faithful. udging by what they posited as the governor’s spirited efforts at ensuring that Muslims were not relegated in the state affairs, the Muslim leaders said it was natural that the adherents reciprocated the governor’s gestures. committed to building on your legacies. Sanni then advised those he said were criticizing the Muslim Community for honoring Ajimobi to wait for their turns. governor. If they treat Muslims fairly, they will also be celebrated. “We were not induced with anything other than the governor’s fairness and equity in dealing with us. We did agitate before he permitted our children to wear hijab. He was the first governor to authorize Hijrah (Islamic New Year) as public holiday. What about the large expanse of land he gave us to build our secretariat, among his several good deeds”.